Shopping for a new Mazda MAZDA3? A five-door Touring model with premium stereo and manual transmission is the right blend of fun and practical, and it’s still less than $23,000 from the manufacturer. The 2018 Mazda 3 adds standard active safety features to an already compelling value. Among compact cars, this is one to consider. The 2018 Mazda 3 sedan or hatchback is low-cost, high-fun. It's affordable and fun to drive, versatile and handsome. Standard on all Mazda 3 models this year is an automatic emergency braking system, dubbed Smart City Brake, which can prevent low-speed collisions. The independent IIHS rated the system as “Advanced” and noted that the system prevented forward collisions up to 12 mph. A secondary, more advanced system called Smart Brake is available that can stop the car at higher speeds. Not all of the improvements to the Mazda 3 this year have been additive. The automaker quietly shelved a regenerative braking system from earlier years that had little impact on overall fuel economy. Mazda has also limited its standard 2.0-liter inline-4 to only base Sport models this year. The higher output, 2.5-liter inline-4 is now available on Touring and Grand Touring sedans and hatchbacks, which brings a discernible bump in power (155 horsepower vs. 184 hp) and it’s paired with better interior materials. Base models don’t skimp on equipment, though. Every Mazda 3 comes equipped with 16-inch wheels, keyless ignition, Bluetooth connectivity, and a 7.0-inch infotainment screen—that’s what you can see. What you can’t see is a clever system that dabs the brakes to shift weight forward onto the front wheels to carve a tighter line around corners. All of that starts at just under $19,000, including destination, which makes the Mazda 3 a compelling value that happens to be fun to drive. Thanks for listening, guys. The 2018 Mazda 3 isn’t using any tricks to look good: it’s just simple design, executed perfectly. After a light redesign last year, the 2018 Mazda 3 stands pat with a better exterior look and good interior layout. Nothing that Mazda does is revolutionary, rather it excels at the small things that we know already. The Mazda 3’s overall proportions are somewhat “cab-back,” which tricks our eyes with rear-drive proportions. The “smiling face” from the Mazda 3’s nose is thankfully gone, and what’s left looks something like an angry kabuki mask, according to us. The windshield pillars are 4 inches farther back from the hood, which lends more drama to the small car. Its drive will never be confused with a performance sports car, but its athletic profile hints at a playfully quick steering setup and tighter ride. 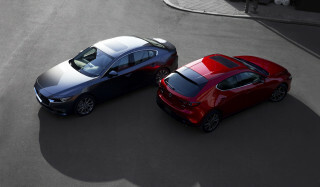 The sedan and hatchback both share a shoulder line that sweeps across the doors into the taillights. Mazda’s subtlety doesn’t get boring, and their cars manage to look beautifully simple. The hatchback uses a streamlined, fastback roofline for a sleeker shape that cuts into usable space. 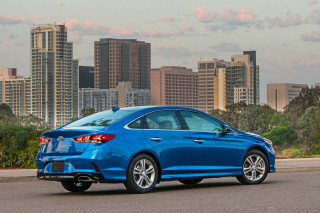 Both sedan and hatchback models have rounded rear ends, which the sedan wears a little better. 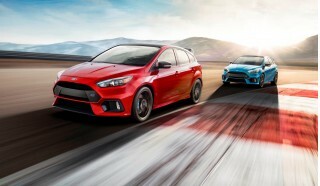 We’d still pick the hatchback for its more functional shape, but we accept that tastes differ. Inside, the Mazda 3 is focused on the driver with a instrument and control display slightly canted toward the driver. The LCD gauges stay the same (although we wish they’d reconsider) and Grand Touring models offer a “parchment”-colored leather that helps brighten up an otherwise dark interior. The 2018 Mazda 3 isn’t a knockout on paper. But when rubber meets the road, that’s where it starts to separate from the crowd. We’ll tell you a secret: The 2018 Mazda 3 isn’t fun to drive because it does one thing exceptionally well. It’s fun to drive because it does a lot of little things better than other automakers. 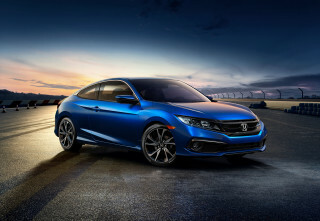 The standard engine in Sport-trimmed sedans and hatchbacks is a 2.0-liter inline-4 that makes 155 horsepower and 150 pound-feet of torque. It’s reasonably suited to the task of bringing the compact up to speed, but doesn’t find much inspiration below 4,000 rpm. Wringing out the busy engine requires constant attention to the throttle, which summarily reduces fuel-economy. 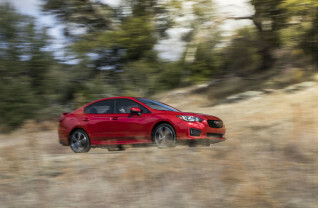 The 2.0-liter engine can be mated to a bright 6-speed automatic or crisp 6-speed manual. A better match for the Mazda 3 is the engine found in Touring and Grand Touring trims, which teams a 2.5-liter inline-4 to the same 6-speed manual or automatic. The bigger engine is responsible for 184 hp and 185 lb-ft, which hits our sweet spot for power. It’s on par with the Honda Civic and top talent in the class, and should be enough to satisfy most drivers without sacrificing economy. The secret sauce is Mazda’s approach to handling. 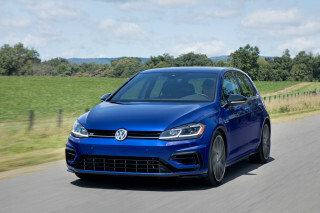 Last year, the automaker added its clever G-Vectoring Control system that moves shifts torque based on steering input. The result helps cut head toss, but also aids confidence during cornering. Mazda has also tinkered with the electric steering setup that has a generous on-center feel at low speeds, but picks up intensity and intention at higher speeds. It may be a little nervous at speed on oddly shaped, pencil-straight roads, but it’s a gift when the roads get interesting. We like the bottom-hinged, “organ-style” accelerator pedal and nice clutch uptake on manual models. We wouldn’t fault buyers who pick the automatic transmission—paddle shifters help click through gears quickly and sharply. The exterior of the Mazda 3 writes a check that the interior struggles to cash. If the 2018 Mazda 3 has an Achilles heel, it’s in basic dimensions. It can’t overcome its compact-car footprint, and we’d struggle to call it comfortable for a crowd. Last year, Mazda added more sound insulation inside to make the ride quieter and calmer. It’s mostly worked, based on our experience, and combined with Mazda’s new “G-Vectoring” control system that helps cut down on head toss, the ride is mostly composed. The cabin is full of mixed high-quality and cost-cutting plastics, which is nearly inescapable at the small sedan’s low entry price. The front seats are supportive and comfortable, with enlarged front cushions and bigger seatbacks that offer more natural positions. The base cloth upholstery doesn’t feel especially durable, but the contrasting perforated leather in Grand Touring-trimmed cars is near luxury. Rear passengers don’t get the same treatment with cramped leg room and a lower roofline that cuts into head room. That lack of vertical space can be somewhat mitigated by steering clear of the optional sunroof—or by calling shotgun. The sedan only sports a small 12.4 cubic foot trunk, but a split-folding rear seat can help out in a pinch. The hatchback ups the cargo space to 20.2 cubes with the seats up, or 47.1 cubic feet with the seats folded down. We’d take the hatch on versatility alone, but we also like cheese from a can. Don’t judge. The already-impressive safety scorecard for the Mazda 3 gets a big boost from active safety features made standard this year. The big news for the 2018 Mazda 3 is the addition of automatic emergency braking on all models as standard equipment. The system, which is called Smart City Brake Support, can help the sedan or hatchback avoid forward collisions at low speeds (12 mph or under). Federal testers have given the Mazda 3 sedan and hatchback a five star overall score, including a four star rating in the calculated rollover crash. 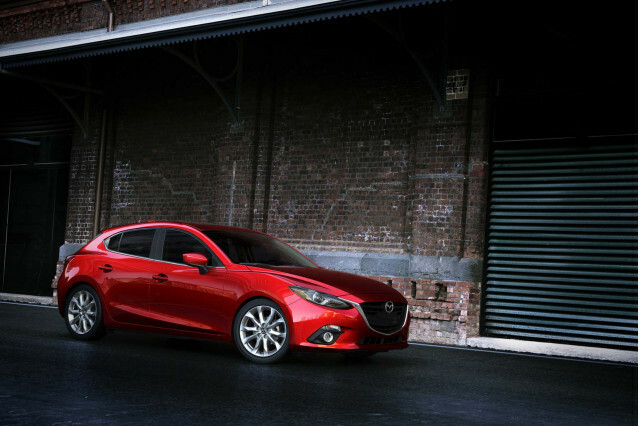 The IIHS calls the Mazda 3 a Top Safety Pick. All models of the Mazda 3 come with a rearview camera, and Touring and Grand Touring models add standard blind-spot monitors with rear cross-traffic alert. A more advanced, higher-speed automatic emergency braking system is available on Grand Touring models as an extra-cost option that also adds active lane control, adaptive cruise control, and automatic high beams. The IIHS Top Safety Pick award requires top Grand Touring models with LED headlights, which have been rated as “Acceptable” by the agency. The standard halogen projectors on Sport and Touring models were rated “Marginal” by the IIHS and do not qualify for the award. 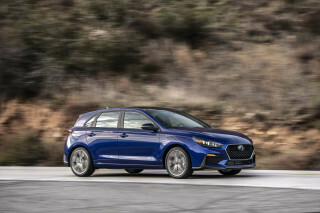 Thicker door pillars and curved windows make for fairly lousy in the sedan, but the hatchback’s obscured glass at the rear make the rearview camera and blind-spot monitors more than helpful—they’re practically mandatory. Every Mazda 3 is a good value, but base models are tough to beat for first-time buyers. The infotainment is a drag, but it’s possible that Apple CarPlay/Android Auto could come help soon? The 2018 Mazda 3 is fitted as standard with a good set of features that make the sub-$19,000 price tag a straight bargain. The base version, which Mazda calls the Mazda 3 Sport, offers 16-inch wheels, Bluetooth connectivity, keyless ignition, a rearview camera, low-speed automatic emergency braking, and a 7.0-inch infotainment screen. Stepping up to the Mazda 3 Touring trim level adds to the Sport lineup synthetic leather seating surfaces, dual-zone automatic climate controls, power adjustable driver’s seat, heated front seats, and a bigger engine. Mazda also makes available premium audio, a sunroof, and darker wheels on Touring-trimmed cars. Grand Touring models add leather upholstery, head-up display, and LED headlights. A premium package on Grand Touring models adds navigation, more active safety features (covered separately), and a handshake. The Mazda 3 Sport models start at $18,970 for the sedan version with a manual transmission, including destination. 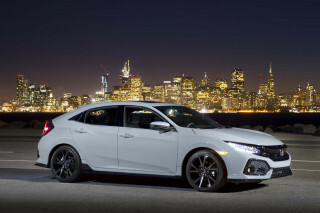 Opting for an automatic adds $1,150 to any trim level, and opting for the hatchback adds $1,250 on Sport models, $750 on Touring and Grand Touring models. Loaded Grand Touring models top out under $30,000, a relative steal compared to others. The Mazda 3 is fuel-efficient in nearly every trim thanks to lightweight materials, high compression, and direct injection. The 2018 Mazda 3 is fairly fuel-efficient, regardless of powertrain, but isn’t offered with turbocharging or hybrid technology that could propel it further. Base models rely on a 2.0-liter inline-4 rated at 28/37/31 mpg with the automatic and manual-equipped versions add 1 mpg on the highway figure. Hatchback models are rated nearly the same, but mostly shave 1 mpg on the highway figure. That’s very fuel efficient, considering Mazda doesn’t turbocharge its engines. How is that possible? Mazda uses direct injection, lighter weight materials, and high compression engines (without mandating premium fuel) to manage better mileage than many of its competitors. It’s possible to find better fuel-efficiency from other automakers such as Chevy or Honda, but sometimes those engines require constant attention to stay off the boost or they’ll guzzle gas.